After you’ve read a few million YA novels, they all kind of start to run together. IN A WORLD of unbelievable grimness and arbitrary sorting of the population, One Special Teen Girl has a magical gift that could change the world… if only she weren’t so distracted by the romantic attentions of a Nice Boy and a Bad Boy. 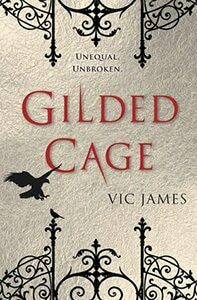 How refreshing it is to read a YA fantasy like Gilded Cage, by Vic James, that at least tries to deliver a more credible world-building experience! The story is set in present-day England, in an alternate universe: they have cars and video games, but they also have Equals, aristocrats with magical powers ranging from healing to mind control. Commoners are forced to serve the Equals for 10 years of slavery, though they can choose when their terms begin, and minors generally don’t begin their “slavedays” until after they turn 18. However, Abigail Hadley has a different plan: by signing up as a group to work directly on an Equal family’s estate, she hopes to keep the Hadley family — teenage Abigail and Luke, 10-year-old Daisy, and their parents — together. But when their servitude begins, Luke is dragged off to an industrial factory town instead. While the other Hadleys settle into their roles as servants for the powerful Jardine family, Luke befriends members of the underground resistance and finds a greater purpose: fighting for revolution. Meanwhile, Abigail has a front-row seat for high-level political scheming as the Jardines plot to become the rulers of England. But not all of the Equals support slavery — and some are even actively working to destroy the institution. Can the commoner rebels unite with the abolitionist nobility to change their world? But if England is essentially a feudal state run by powerful magic-users, why wouldn’t they simply enslave the entire non-Skilled population for life? It’s never explained how the magic number of 10 years was chosen, or why slavery isn’t permanent. And, since the commoners can choose when their slavedays begin, it’s unclear why everyone wouldn’t simply put off their slavedays until they were old and essentially ready to die. What penalty would matter then? And how could prison be any worse than the slave towns, which are essentially labor camps? All right, so it’s not perfect. But at least this novel attempts to move beyond the tropes and develop a genuinely interesting alternate-history universe as a setting. And in circa-2017 America, the themes of political corruption, oppression of the few by the many, and the dangers and fears of resistance are even more relevant than the author may have realized. Since this is the beginning of a series, I’m curious to see what flies out of this gilded cage next.